And These Are the Days of Our Lives. . . It seemed to me like I was changing a lot of light bulbs. Three weeks ago, I started keeping count. I changed three light bulbs on week 1, three on week 2, and this week (week 3) I've already changed SIX light bulbs. I have to buy the majority of my light bulbs "on the economy" and this month I've already spent 31 euro on just light bulbs. It's like they're becoming a monthly expense and a weekly (sometimes daily) job for me. It's getting a little out-of-hand! I know, positively, that I didn't change light bulbs this often in my home in Maryland! I got my hair cut again, about 10 days ago. I had Martina take another 2 1/2 inches off. The back is super-short. The front is shorter than I would like, I wish she would have only taken 1 1/2 inches off the front. But, it's a great haircut, and it will grow! I asked Thomas to take some pictures of me this morning. I felt like my 5-year old was taking mugshots of me, but it was between him, the baby or the cat! Happy Birthday to my sister, Kate. She was born on Thanksgiving Day, 27 years ago. With the eight hour time difference, it is sometimes tricky to get a hold of each other. I left two messages, but she's not home from work yet (she teaches college classes to students attending high school). I'm proud of everything that she has done and the person that she has become, I'm proud to call her my sister. She does a lot for our family. And, I hope she has a great birthday! I am feeling better but am still pretty weak. James offered to take a "Family Friendly" day (sick day because someone in your family is sick or has to go to the doctor)and I think he was secretly hoping that I would think the offer was kind enough and then say, "No, I'll be fine, you can go to work". But, you know what? I didn't! I took him up on the offer. James has taken Thomas to preschool and left me with Toby. Which is fine. He is pretty fussy--he's still never totally recovered from last week. He's lost some weight, which is no surprise because he barely eats, but you can see it in his face and thighs. While the Snow household has been dealing with sickness this weekend, James has gotten a lot organized and unpacked and set up the TV and the stereo system (we had a "make-do" set up before). It made me wonder why I can't get things done like that but then I look around and see that there are toys everywhere, no laundry has been done, no cooking etc. But, I am glad that he has gotten so much done! The exact moment when the vicious stomach flu from hell hit me. I was almost positive last night when I went to bed that it was coming on. I was sick through most of the night but fortunately, since it's a weekend, James has been able to take care of the kids and let me sleep. The aches and pains that followed last night's episode, are almost worse. We had hoped to hit a Christmas market this morning. Leaving right after breakfast. The weather today was also cooperative, the sun was out, it was bright and shiny for the first time in what seems like two weeks at least. But, it was not meant to be, Thomas got hit with the stomach flu late last night and was sick throughout the night. He's been camped out on the couch all day today watching The Polar Express (I think he watched it 5 or 6 times). Toby is still not himself. He's hardly eating at all. I, personally, feel like a walking time-bomb just waiting to get sick. With 3 of the 4 of us already afflicted, I feel like it is only a matter of time. James feels fine now but it wasn't until Thanksgiving when he felt well again. What time will you be eating Thanksgiving Dinner today? Is it more of a lunch or a dinner? We are aiming for 2:00 PM. I think it will all depend on the turkey (being cooked in a crockpot). All I have to do today is make the jello part of the jello salad, and make the mashed potatoes. And keep the food moving in and out of the spacious oven... I have two more crockpots that I think I will be partitioning off to keep food warm. James has to make the filling for the lemon and banana cream pies. I already made the pumpkin cheesecakes(one for us, one for the family we are taking dinner to) last night. If you are cooking a dish or two this Thanksgiving, or especially if you are cooking "the whole thing", like I am, here are three more reasons you should be thankful that you have your kitchen--not mine! Let me be clear about this, though: my kitchen is not outdated, this is the "German way". My stove. It is barely big enough to fit a 9x13 pan. I had to go out and buy muffin tins that would only hold six because the more common one dozen ones do not fit! And, you can only cook one item at a time. It has two racks, but if you try to cook two things at once, the top item will burn on the outside and stay raw or doughy on the inside and the bottom item will hardly cook at all. Despite having a Fahrenheit thermometer, I find that almost nothing turns out the way I am used to. The temperature also fluctuates so much that I try to check the thermometer every 10 minutes. For whatever reason, German homes do not have garbage disposals...but they have nifty little buckets built right into one of the doors underneath your kitchen sink. I take this waste out every couple days or until it gets stinky, whichever comes first! I think it's disgusting. Toby threw up for about 13 hours yesterday....I lost track of how many times he actually vomited, but it was well over a dozen. Poor baby! I was up with him twice last night and on the third wakening, I nudged James and had him get up with him (he's taken today off to help with Thanksgiving preparation--something he had planned on doing weeks ago). But, throughout the night, we gave him Pedialite which he was able to keep down. So, last night, even though he was up three times, it was more for a drink and comfort at least not vomit control! This morning, he had a wet diaper so I know he's not dehydrated. He had one jar of baby food this morning and so far has kept it down. He's already down for his morning nap. I suspect he'll sleep quite a bit today as long as he doesn't get sick again. We're going to work on Thanksgiving prep and then load the family up to go to preschool. Thomas' preschool is feeding all the kids and the parents that can join in, their own Thanksgiving dinner right at 1:00. After our Thanksgiving celebration with the kiddies, James, Toby and I will run a few errands to kill time. Stay tuned, though, I'll be posting some pictures of my inadequate kitchen that I'm working in this year for Thanksgiving! I believe when you see one thing in particular, you will be VERY thankful! Toby has the stomach flu now. I have spent the whole day cleaning him up, cleaning carpets and washing blankets and such when I'm not holding Toby, trying to console him. He can't keep anything down. Let's hope tonight is better. Thomas: Mom, who folds all those socks--one inside a-NOTH-er? Emily: "Well, I do Thomas." Thomas: (with eyes opened wide)"Wow, I can't believe you do all that work!" (Glad to know that my son now thinks I live a purposeful and productive life--I can't wait until he finds out that I also refill the salt and pepper shakers occasionally). James is still not feeling well, but has spent less time in the bathroom this evening. He was able to eat some yogurt and is now asleep on the couch. Before he went to sleep he was complaining that our house is cold...it's 76 degrees and holding, so I conclude that he has a fever. Toby has gone to bed already, which is pretty early for Toby, so I hope he is OK. Thomas and I will be going to bed within the hour. I am exhausted but he is building a train track at the moment. Thomas' talk went well in Primary today and so did my lesson in Relief Society. I won't have to teach again for another month, so at least for this week and probably next week I won't worry too much about my lesson. I didn't get any Thanksgiving food prepared today, as I had hoped. I know I could do some tonight (it's still pretty early) but I am beat! The exact minute when James' violent stomach flu began. He has thrown up every hour since and now he's sick coming out both ends. Of course he won't drink or eat anything that I have given him...he's one of those pathetic sick people. I went to the couch at about 5 AM only to have Thomas join me at 6 AM because he heard his dad being violently sick and was scared. I got him settled by about 6:40 AM only to have Toby wake at 6:50 AM! With very little sleep, today will certainly seem like a LONG day! James and I were both on schedule to teach this afternoon. I'm going to have to put a call in at 9 AM to let someone know that James won't be coming to church today. I have also been queasy all night but so far, nothing has come of it. Thomas is also talking in Primary. As far as our Thanksgiving plans go, we are going to have it at our house, for the four of us and I'm going to send all the side dishes (I'll make double) to the family that helped us out so much when we first arrived here. I would have them over, but the wife is going to have her thyroid removed on Tuesday. Truth be told, I suspect that they won't be home on Thursday. But, they can heat up the side dishes on Thursday night or on Friday. The husband it taking care of their turkey. I will start preparing Sunday night and do a dish or two every day until Thursday. If all goes as planned, I will only have to throw dishes in the oven on Thursday and worry about the pies and rolls on Thursday, which is enough--especially since both of these are crucial to James! I have had numerous inquiries about our other new car. More specifically, pictures have been requested! If you live in MD, VA, PA, or you are my mom, then you have most likely already seen the car (technically categorized as a"crossover"). But for those of you who don't already know, we bought a 2007 Kia Rondo in April, a car we selected for a few reasons, it's bigger than our old one to meet the needs of our newly expanded family and also able to fit a guest or a friend for Thomas, if needed (it has a third row seat that folds down, so it can fit 7 (although I say 6 because car seats seem to take up so much room) yet small enough to drive around in Europe. We have been very pleased with this car and it is perfect for this area. As I am sitting up tonight, waiting for cough medicine to start working, (I've got one of those annoying coughs that feels like you have the tiniest piece of popcorn in your throat) I decided to post. I have accepted that I have a wacky obsession, one that has taken up lots and lots of my time lately. I am referring to the heat in our house. As you may recall, I had a plumber look at it and he showed me how to adjust it. Since his visit, things have been better but still not optimal. I have spent many evenings, taking out the owner's manual and looking up words in the dictionary in my attempt to figure out the radiant heating. While the main floor has been much better, the upstairs has been entirely too cool especially since we are below freezing at night. Today, I had planned on dropping Thomas off at preschool and then going to the Four Seasons shop on the base to buy three space heaters, one for each bedroom. This morning, as I was putting away laundry and such, going up and down the stairs 100 times a day like usual, I glanced up and thought about what might be behind the metal door in the middle of the wall. I turned the knob, lifted the door out of the wall, and what did I find? Six valves, one for each room upstairs! And, each valve is labeled in English! It was like I had won the lottery! I immediately turned the main valve and started to get some heat going upstairs! The upstairs is the most comfortable temperature it has been. I was thinking today that it's too bad the main floor doesn't also have a valve control area like the upstairs. And, wouldn't you know it, I discovered it in our house tonight. I have turned that down a couple of notches. I'd like to get the downstairs down to 70 F and not by accident. Right now, it's 76 F--a little too hot in my book. And so, sadly, I look forward to waking up in the morning and checking my digital thermometers and seeing if I made any progress with my radiant heating adjusting. Sadder (is that a word?) still, is the fact that I have that same anticipation that a child has on Christmas Eve--the "I can't wait" feeling. I told you it's a wacky obsession! Today is my Grandma Kay's birthday. She will be 94 today! She has the best birthday ever: 11/12/13! How cool is that? A Grandmothers Love Means So Much. appreciates you, and loves you. that goes on and on for us. Happy Birthday & Many More! So, that meant the boys and I spent Sunday together. It would almost seem like a regular day except that we didn't go anywhere except for church. We leave for church at 1 PM and get home around 5 PM. I really don't like this time slot. I was happy to find out yesterday that with the turn of the New Year we will switch to 9:30 for a year. Starting that early will have it's own challenges but it will be better than 1:30. James got home just in time for us to eat leftovers from the day before. We hung out with our kids for a while, Toby was wasted because he won't sleep at church, therefore he didn't get an afternoon nap. We had them both in bed by 8:30 PM and then James and I just vegged out in the living room for a while. I was exhausted and went to bed by 10 PM. I don't often go to bed that early, so you know I was tired! Today is James' 39th birthday. This weekend, James is actually preparing for an upcoming business trip, so we are staying local for his birthday, and keeping it low-key. Since we have been less-then-inpressed by German cuisine, I am making him a yummy dinner instead. Happy Birthday James!--We love you! We got our first snow today. It wasn't even in the weather forcast. I was driving home from grocery shopping this afternoon at about 4:30 PM as it was almost dark and raining hard when the hard rain turned to slush and then to snow all within two minutes. I don't know if it will stick around tomorrow or not. Thomas wanted to go out and play in it but I was a mean mom and told him it was too dark outside and I have no idea where his snow clothes are (truth be told I'm not sure they will fit--when I do find them). The other excitement of our evening is that we have no water. At first, I was worried that my tampering with the heat downstairs might have blown up something but then my friend that lives around the corner called to see if we had water. After some more phone calls, we have found out that at least half the town is out. I am very interested to see how fast this will be fixed. Hopefully, we'll have water by tomorrow morning. We have enough bottled and gallon water to get us through for quite a while, but we certainly can't bathe or shower in it! I'll keep you posted on our water situation! UPDATE: Our water came back on tonight! Three months ago tomorrow, we arrived in Germany. In some ways, I can’t believe it’s already been three months, in other ways, it’s been a long three months! James came home (late) from work last night and announced that, “Well, I think I can do this job”. I commented that three months must be the magic number…it was last week that I thought to myself that I can “do this” also. James’ job is very demanding, much more so than we were expecting. The traveling part we were aware of. It was “the rest” that has been a surprise. Like, the fact that when he returns from a trip it is expected of him to go in on the weekend and work which stinks because usually he leaves the weekend before. Or, that he’ll be working late often, especially when he’s recently been on a trip or is gearing up to go on one soon. And, of course, sometimes he has to work late just to catch up. Getting a lot of time off at once is tricky because there are so few people that do what he does. Our hopes of touring Europe have been diminished to “maybe we’ll get to see some of Germany”. But, maybe that will change as well. We are very thankful that we have base privileges. Our commissary, the grocery store, is quite nice, it's like a decent-sized Giant or Smith's. The PX (similar to a Kmart) has quite a bit. I recently tried to purchase something cute and unique “on the economy” for a good friend that just had a baby, only to decide that their clothes are UGLY and went back to the PX! Our PX has a good selection of drugstore makeup as well as department store makeup (such as Clinique). They also have a limited selection of Victoria Secret and Bath & Body Works lotions and scented products! We’re thankful that we can buy our gas on base and get the US price. We do not know how the Germans afford their gas, it’s almost double what we pay! The nicest surprise that I have found is how friendly the Americans are on the bases. Everyone smiles and seems to be looking out for one another even if we are strangers. Like the other night, I was there and discovered that I had left my diaper bag on the ground outside of my car, instead of hanging it on my stroller. We were heading out of the food court, to retrieve it, when a woman approached me and asked me if I had a brown and blue diaper bag and if so I had left it outside. I got out there and another man was guarding it. And, you get and give those “this is hard living over here” glances all of the time. We’re all going through it. And, I have to remind myself that a lot of these people will do it over and over again or that their spouse is currently “down range”. The German people that I have come in contact have been very friendly. Some of my American friends have not had the same experience… but my experience with them has been great. In fact, I have found that they go “above and beyond” what they need to. An example I can give is the plumber that came over yesterday morning. He was here 20 minutes and I thought that was the end of it. Five hours later, I heard a knock on my door only to find the plumber again with a bunch of bathroom gear in his arms. He then told me that “when I was in your bathroom, I noticed some other things that needed to be fixed”. So now I have a new toilet seat and new hoses for the shower heads in the tub and shower. These were things that I thought were “fine” but obviously not up to his standard. So, he called the woman that had arranged the original visit, she called the landlord, and they got it all worked out before I even knew it was an issue. I have been increasingly concerned with the fact that Toby has been unable sit up. I have practiced with him with absolutely no progress made. I became very nervous when he started crawling. How can a baby crawl and not be able to sit up? That's not how it's supposed to happen! Yesterday, it was like some kind of imaginary button was switched on Toby. He sits! He's great at it! Just like that! As of Tuesday, the US dollar will buy you .6729 euro. Or another way of looking at it, it takes approximately $1.33 in dollars to equal $1 in euros. While it has turned quite cold outside, and we bundle up in coats and scarfs, scurrying off to the car my house has remained hot! When you have the windows opened and the fans going and it is that cold outside, you know you have a problem. Downstairs, on the furnace, the owner's manual is taped. Which is great, but it's all in German. This morning, I had a plumber come to fix a problem with our one and only tub. You know, the one that I use daily and the kids use every other day, at least. It turned out not to be a big problem (he fixed it in 5 min) but it was the kind of a problem that you need a special plumber tool for! Anyhow, the plumber was also nice enough to take a look at the furnace. He adjusted it, and told me how to adjust it further but the biggest problem was the clock was set wrong. You see, the thermostat I have in the dining room has a day and a night setting. When I did on occasion, want it warmer, it didn't seem to work and then I'd completely turn it off, and it would seem to get hotter. I guess day and night don't quite work out when your clock is completely wrong! Radiant heating takes almost a day to totally adjust, so it will probably be tomorrow until I can tell a big difference. But, I am hoping this is the solution! It does leave me wondering--how did the previous tenants live with it this way? I figured out this afternoon that the neighbors are gossiping about my backyard. News travels fast about what I have out there...and how I add to it every morning. It's all good, though! Actually, I'm talking about my feline neighbors because now, four cats are better than one! That's right, I've added another cat! Thomas was outside playing this afternoon when I heard him tapping at the back door. I went to the back door to see what he needed when he showed me the kitty. Because Thomas was no more then two feet away, I knew she was tame. I went out, scooped her up and she was, indeed, very friendly. She reminds me of my mom's Porter and my friend, mlk's Sam. (She's kind of tabby with white paws). Except that she is a petite tiny thing and is a girl. The name that immediately came to me as I scooped her up is Sabrina. So, now we have Tailer, Gypsy, Jasmine and Sabrina. One thing is for sure, I'm going out tomorrow to buy cheaper cat food for those outdoor cats. I can't feed four cats Iams! Spit happens. More specifically, spit-up happens. And, unfortunately, it happened to both of my children. Thomas' spit-up issues were abundent but all but resolved by the time he was six months old. Toby, well, Toby has been another story. Compared to Toby, Thomas's issues were mild. Well, I am happy to report that 9 months seemed to be Toby's magic number! While he still occasionally spits up, it's usually just a tiny bit, he no longer has to wear bibs and I'm not doing near as much laundry. He's on regular formula and I've quit the Zantac. Hallelueah! I am happy to report that the main floor of our house is almost entirely unpacked! (I know you all are probably saying, "it's about time!") I spent a couple hours Friday night cleaning and straightening up the living room, dining room, and kitchen, pretending (as I had for a while) that the large boxes that lined the perimeter of our living room and dining room did not exist...I went to bed happy that we could start the weekend off with at least a clean main area. James got up Saturday morning and I figured it was OK if I slept in an hour since I had cleaned the night before. Unbeknownst to me, James had other plans... to my horror, when I came down the stairs James had emptied--I don't know how many boxes! There wasn't an inch of space unoccupied...the table and all of the chairs, the kitchen counters, he had even thrown a box of coats and jackets on the living room floor, oh, I don't know exactly why...but I was not happy in the least! At this point, I was feeling so angry and overwhelmed at the same time, I just wanted to flee for the day...but I had no where to go so I had to face the mess that was before me. After the argument that of course he knew would be a result of his actions, James went outside to start trimming the tall shrubs behind and to the side of our house. These needed to be trimmed since the day we moved here. The landlord should have had it done before we moved in. This past week, I went as far as getting a quote to have the work done. Which we would pay for, not the landlord. I realize that we have been busy and that James has been out of town and very busy at work but I am getting fed up and embarassed by how it looks. So, he went out to trim the overgrown shrubs only to come in about twenty minutes later...the trimmer battery was dead. Let me clarify--he didn't charge it beforehand (and he knew he was going to trim on Saturday). And, it's not the type of trimmer that you can plug into an extension cord and keep going. So much for getting that done this weekend! Even if James wanted to do it today (Sunday) he couldn't because Germans do not do noisy work on Sundays, including trimming trees or mowing lawns. It is dark here by 5 PM but James says he'll try to do it a little at a time this week and try to go to work earlier and come home earlier this week and it not he'll do it next Saturday. I really hope so. But, like I said, the main floor of the house is unpacked. Even though he has frustrated me with his tactics (Saturday is not the first time that he has done this), I do have to credit James with moving it along. We don't have a single decoration on the wall yet and everything is still in a disaray, but it is better. Upstairs, Thomas' room is unpacked and then there are a few boxes in the other rooms but much progress has been made. When the movers brought our things, we could barely turn around in most of the rooms, there were so many boxes! Seriously. This past week, I was even able to go through Thomas' and Toby's rooms and put away their outgrown clothing. All the the 5T stuff is boxed away as well as all of the 6-9 and 6-12 stuff. The basement is still very scary but the basement is only for storage and laundry so I'm not that concerned about it. One day we might have an office again, but since we have a laptop now it's not all that pressing. We found the printer, we plug the laptop into it when we need to. This week, we are going to call the moving company and have them come and get the boxes and packing paper that we have in the backyard. Due to the recycling laws here, it is very hard to get rid of mass amounts of cardboard and paper so I am glad that they gave us the option of a "one time" pickup. We'll have to deal with the rest on our own but that's OK. Here is a picture of our front door (to give you a little better idea of our new surroundings) and a picture of the Halloween sugar cookies that I made on Thursday night. I only made a half batch which is really a full batch because my normal "batch" is actually a double batch. I bet that sounds confusing. If so, back up, read it again and you'll probably understand! Regardless, it felt good to take time to do something like this that I enjoy. I took most of them to a Halloween party hosted by my neighbor across the street on Friday. She couldn't have it on Wednesday because she had a conflict. My cookies were a hit by kids and moms alike! In case you've been wondering, we finally got a renter in our home. He moved in on October 16. He's a single guy, the only one on the contract. However, we quickly found out (it's good to have neighbors) that his mom and girlfriend will be there too. I don't really care, just as long as the rent is paid and they don't destroy the house, but I find it a bit shady that he didn't disclose the information (technically everyone 18 and over is supposed to have a credit check). Anyways, it will feel good to not make our mortgage payment for a while (he's only signed until June when he can either re-sign or we'll put it back up on the rental market again) and bounce back from the financial drain that moving here has been on our bank account. 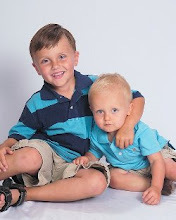 I am a stay-at-home mom to three little boys, Thomas, age 9, Toby, age 5 and newborn Trevor born in August 2011. My family also consists of my husband, James, and our 10-year old cat, Tailer. James and I have been married for 13 years. I started this blog in 2007, shortly after moving overseas. I was a little more committed to keeping it updated better back then. But, I still post here from time to time!